The ProFX series v2 sounds better than ever and supplies convenient features at every knob, fader, input and output. This is the ProFX12v2. It features 6 extremely low-noise Mackie Vita mic preamps designed to add life to any input, as well as the ReadyFX effects engine with 16 great-sounding effects including reverbs, delays and choruses. A 7-band graphic EQ is available on the master output, switchable for tuning mains or monitors, and an aux output is perfect for driving a monitor mix. There is a 3-band EQ (80 Hz, 2.5 kHz and 12 kHz) on all three input channels. The input scheme features six XLR inputs with TRS option, as well as dual 1/4 in. stereo input channels. A built-in USB interface allows recorded music to be played between sets, and you can even use it to bus your mix to a recording device. Insert, 100 Hz low-cut filter and 48V phantom power on all mic channels. 60mm faders. You can directly connect guitar, bass and other instruments via Hi-Z input or connect a microphone and take advantage of the Vita preamp. It features a 100 Hz low-cut filter and 48V phantom power on all mic channels, along with a stereo RCA tape I/O with input level control. A headphone output with separate level control gives your engineer a second point of reference. 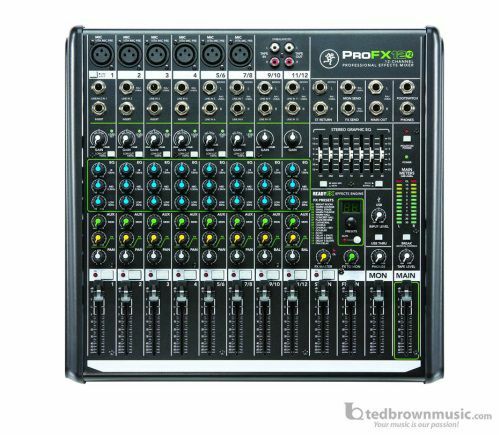 The ProFX8v2 also has Balanced XLR and balanced/unbalance 1/4 in. main outputs, an FX mute with remote control via footswitch, and a break switch that mutes all channels for music playback between sets.